My favorite part of Easter is the potential for cute craftiness. Everything chick and bunny craft is fair game and the cuter the better! Whether you're hoping to make some fun Easter treats, homemade Easter gift baskets or a few unique homemade Easter gifts (like these Easter Sock Bunnies)... the following free printables can help make your gifts more "Hoppy!" Start with a clean pint-size Mason jar and Lid. 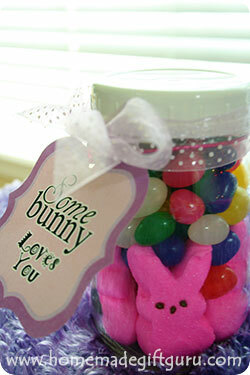 Insert several bunny-shaped Peeps facing outside the jar. Fill the rest of the jar with jelly beans. 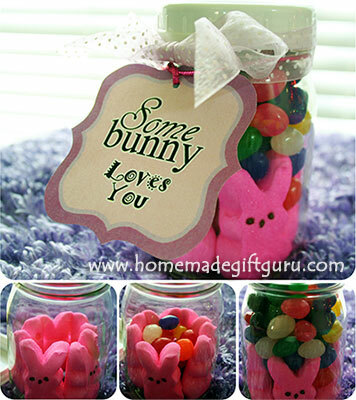 Decorate the jar with a "Somebunny Loves You" gift tag and ribbon tied in a bow. I recommend printing these gift tags on card stock for best results. For extremely vibrant colors, I like to use this special presentation paper here. It's a great thickness and you'll get much more vibrant colors from your printer simply by using this paper. These "Somebunny Loves You" Easter printables are perfect for attaching to a box of bunny-shaped Peeps. They also make a great gift tag for a homemade no-sew sock bunny. 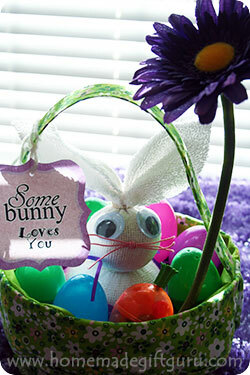 They can be attached to any Easter themed gifts or gift baskets... enjoy! One of my favorite bunny-themed surprises I like to give, are these baby sock bunnies... They are incredibly cute and inexpensive to make. They fit perfectly inside large plastic Easter eggs, making them a fun surprise! So CUTE sock bunny tutorial! 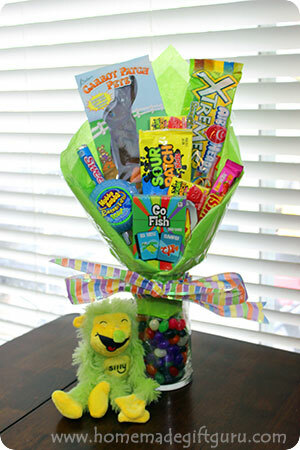 Instead of another Easter basket... consider making a candy bouquet for a unique Easter gift idea. 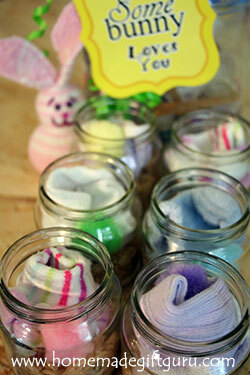 Make super fun, super cute sock bunny kits in a jar!